The word “legend” gets tossed around with alarming regularity, but there’s one neglected Rocker in particular who qualifies. Not just because he was great, but because most of the stories about him sound wonderfully, ah, “embellished.” That’s the only disclaimer you’re getting, here. His music obviously stands on it’s own. The songs speak more than stories and rumors ever could. Not that I’ll let that stop me. Just know that the music is real. Some of the stories…maybe not, but they’re fun. Tall Tale #1: It was reported that the Colonel didn’t worry about any other Rockers taking the place of Elvis when he got shipped off to Germany. He said none of the others had the combination of charisma, talent, and ability to make girls swoon. So long as you didn’t count Eddie Cochran, who the Colonel considered courting and promoting while E slept in the barracks. A possible Plan B. 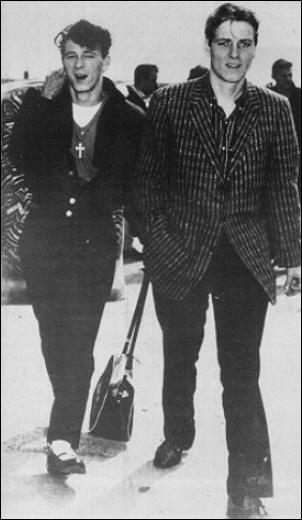 One thing Eddie had over Presley- he wrote his own songs and played his guitar for real. He wrote rollicking tunes that captured the Teenage Rock & Roll Dream, only Chuck Berry could do it better. When you take a tune like Summertime Blues, it often slips in one ear and right out the other; you associate it with the oldies station on your clock radio or piped in at Carnival Shoe Store or someplace. Old and considered inoffensive. You might barely even notice that it’s on. But when you listen to Summertime Blues on purpose on a good stereo, you can hear the things inside the production going off like firecrackers. That beat is ironclad. It’s a real cruise of a song, you can feel the wind in your hair from the rolled down window. You recall the troubles you had if you were a typical kid, and how really nothing was all that bad. You were just itching to be grown up, and the world from the perspective of an 18 year old seems like a kind of clarity later life tends to slap out of you. Eddie won the heart of a songwriter named Sharon Sheely. Or she won him by virtue of her jeans, if the ad is to be believed. Either way, they were a talented couple. 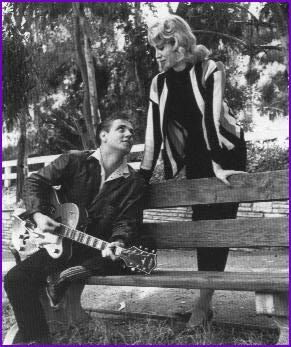 She had written Poor Little Fool, which was based on her experience dating one of the Everly Brothers. 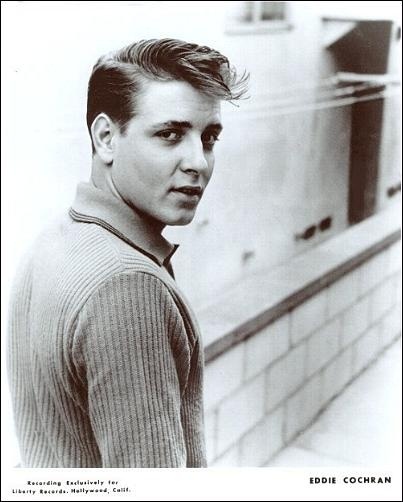 Ricky Nelson had his first hit with that track, putting a nice paycheck in her purse. Her and Eddie worked together in the studio, and they were a good fit. In pictures of them together you can see the young love, one could easily imagine them on their way to great things. As the 50s drew towards their close, gigs started drying up as Rock & Roll began to drift out of favor. The deaths of Buddy, Ritchie, and the Bopper cast a long shadow. Touring in those days was a shady proposition for those young guys. The record labels saw them as part of a fad at best, potential public relations problems at worst. Town to town they would face angry protesters, you’ll recall Rock & Roll was still controversial “Race Music” at that time. Promoters left them out to dry in horrible conditions, the law of averages was against anybody traveling like that so frequently back then. Eddie had premonitions of an early death. And besides, he wanted to stick around the studio. He had been producing sessions. Instrumentals, Pop Songs, Doo Wop, it was wide open. The outtakes of recordings from that period are revelatory. Here was a kid, no more than 20 at the time, calling the shots with men twice his age. But the money wasn’t rolling over fast enough, and America was tightening up. Gene and Eddie went off to Europe, where they were greeted as conquering heroes. To this day they’re held in higher regard there than anywhere in the US. During my time in the UK my heart swelled with pride when I found that record stores held more stock on either of those two than they did on Elvis. Can you imagine how these two guys ripping through White Lightening put the zap on the heads of those British kids? This brings us to Tall Tale #3, one of the saddest stories I know. One night Gene, Eddie, and Sharon found themselves piled into the back of a cab, racing away from a gig. The driver hit a bump, the car flipped, and Eddie leaped to protect Sharon, to cover her body with his. He was thrown from the car, busted his head, and died a day later. Sharon suffered a broken pelvis and a heartbreak from which she would never quite recover. 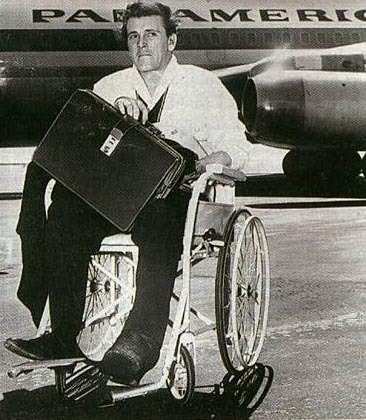 Gene’s already crippled leg was further destroyed. He was delusional in the hospital, kept seeing Eddie around every corner, waiting to jump out and yell “surprise!” It was a broken and crushed Gene Vincent who returned home. It was April, 1960. 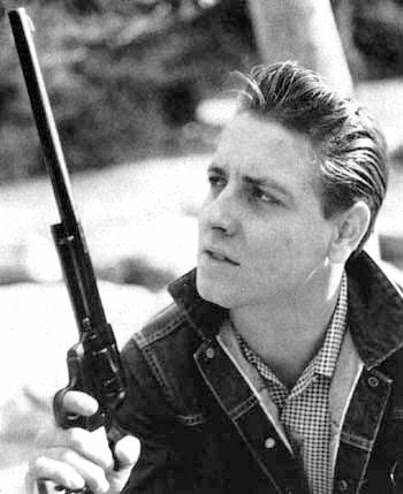 Eddie Cochran was 21 years old.